Shrubs are sweetened fruit vinegars, also called drinking vinegar. These tart thirst quenchers are a recent discovery for me, but shrubs have been around a long time. They are what my grandmother might call a 'porch drink', cool and refreshing. While researching blueberry recipes, I stumbled across a recipe for Blueberry Shrubs, I'd never heard of them. After a little Googling, I was intrigued, seems these beverages have been around a long time. You can read a bit more about shrubs here. There are two schools of thought on making shrubs: to cook or not to cook. I chose not to cook mine, and I love the flavour, so I'll stick with that method. This is not a recipe that requires precision. Basically, fill a sterile jar with berries and cover with a vinegar and sugar solution. Feel free to vary the ratio of fruit, sugar and vinegar to suit your taste. This is the recipe I used to make my blueberry shrubs. 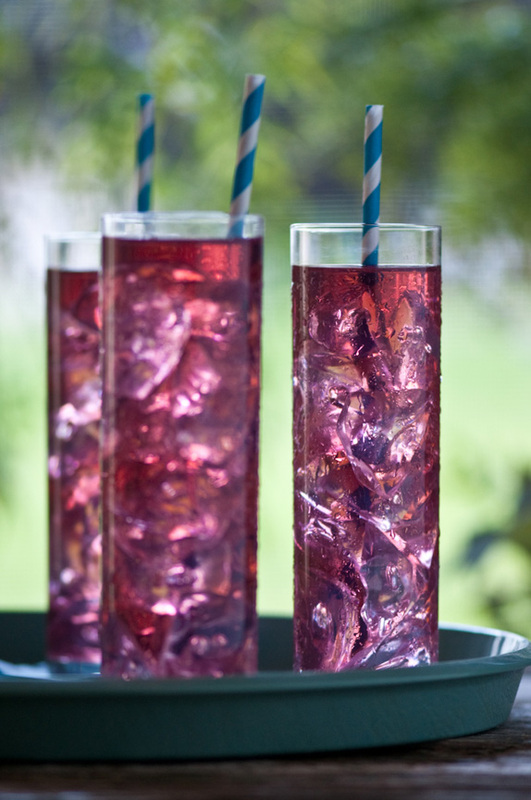 To serve, fill a tall glass with ice, add a couple of tablespoons of shrub, and fill the glass with water. You can use sparkling water if you are in the mood for bubbles. Shrubs also make delicious cocktails. Add about a tablespoon of shrub to a glass of Prosecco and throw a couple of berries in to garnish, Voila! Now that I've discovered sweetened fruit vinegars, I'm dying to try some different flavours. There are some really inspiring ideas here, the possibilities seem endless.